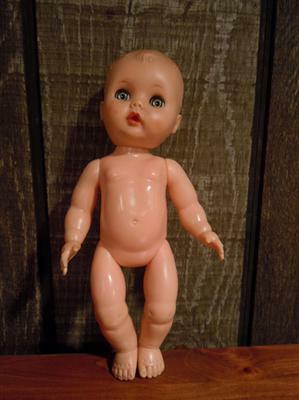 Can you help me identify this doll? It is about 9" tall. She has a rubberish head, and a hard plastic body. There is a hole in the derriere. Her eyes close and her major joints move. Any thoughts? Thanks! Marilyn,thanks for your comment. I have learned nothing further about this doll's identity. Should I come across any information in the future, I will share it with you. Hopefully somebody out there can help us. I would love to learn more about my doll too, where it was made, what name it was called, what it is worth today etc.. If you have any information to share, please, I'd love to hear from you.